Around 1970 I was a very proud owner of a Schwinn Classic Sting-Ray. It was a metallic royal blue with matching “banana” seat. As a girl, I had the requisite white basket with flower appliqués. Naturally, my brothers wouldn’t be caught dead on my bike. But I spent most of my good-weather days on that bike riding around with my brothers and the neighborhood kids. In 1963 the Sting-Ray was released. It was met with a varied response. Adults thought the design was “ugly” or “weird”, where kids loved it. Despite the price tag of $49,95, the Sting-Ray rapidly became the best-selling bike in the US. Schwinn sold over 40,000 Sting-Rays just in the first year, and probably could have sold more if they hadn’t run out of 20-inch tires to put on the bikes! Schwinn continued to lead in bicycle sales for the next ten years, releasing new colors and styles each year. 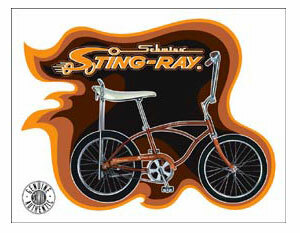 In 1964 Schwinn released the first Sting-Ray specifically for girls, called the Fair Lady model. This bike was painted in pastel colors and was equipped with a basket. This model was a tremendous seller. In 1968, 70% of all bikes sold were Sting-Rays or clones of the popular bike. Schwinn had become an American icon. The most popular model of the Sting-Ray was, and continues to be, the Krate. With its 20-inch rear and 16-inch front tires and hot-rod colors, this bike “was by far the most tricked-out Sting-Ray ever created”, according to the Schwinn website. I have to agree. 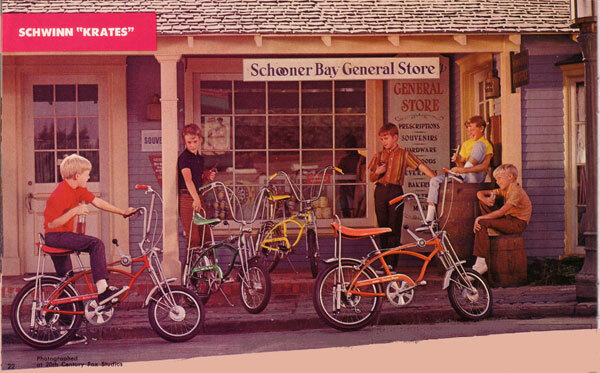 There wasn’t anything else at the time that one child would have envied another for more than one of these bikes. This model was introduced in 1968 priced from $86.95 to $129.95. In two years’ time, Schwinn sold over one million Krates. Things got tough for Schwinn when they failed to follow the shift in popularity from the Sting-Ray to the BMX bicycle, then to mountain bikes. In 1993, Schwinn filed for bankruptcy. The Schwinn family was bought out and the company was moved the following year from Chicago to Boulder Colorado. The name was changed to the Schwinn/GT Corporation and continued to operate successfully under new management, until they ran into trouble in 2001 and had to file for bankruptcy again. Pacific Cycle bought the company in September of 2001, and was in turn bought by Dorel Industries, Inc. in 2004. The Pacific Cycle Division in now based in Wisconsin and still manufactures Schwinn bicycles today.